Lush, steamy and unmistakably tropical, Colombia’s Amazon region seems very remote, even from the rest of the country. The main town, Leticia, is an easy-going, friendly little place, located right on the border with Brazil and Peru. 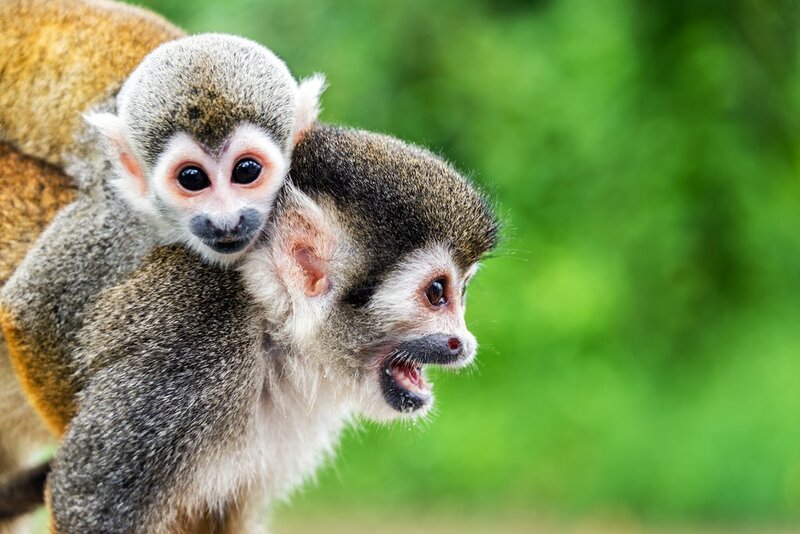 But the main reason to visit is the Amazon River and the vast rainforest that surrounds it – full of strange and exotic plants and animals, from lazy sloths to electric eels – a massively important environment that provides a lung for the whole planet. 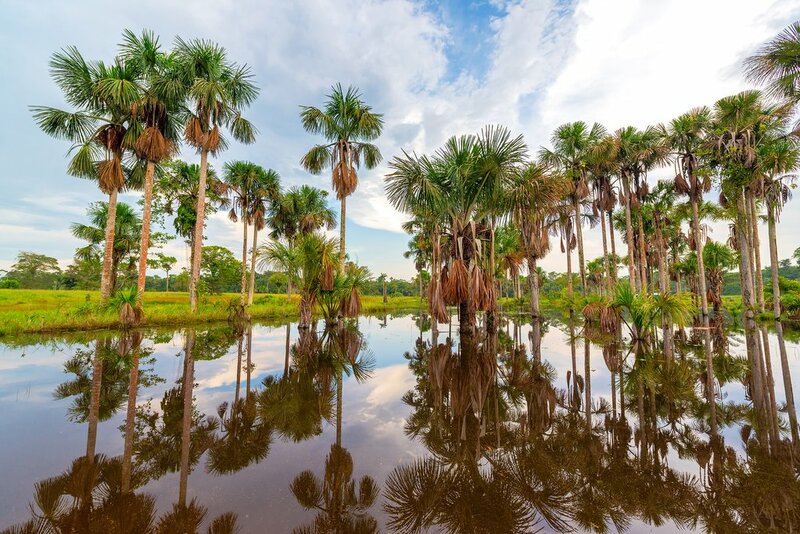 Reflection of palm trees in the waters near Leticia. The Leticia trapezium is a little wedge of Colombia forcing its way down between Brazil and Peru to give the country a toehold on the Amazon. Across the river, the Peruvian side (which you can visit freely from Colombia for up to 80km) is low forest, completely inundated for three months of the year. The Colombian side, by contrast, is high forest, irrigated by multiple rivers, but never completely flooded, giving it a completely distinct ecosystem. 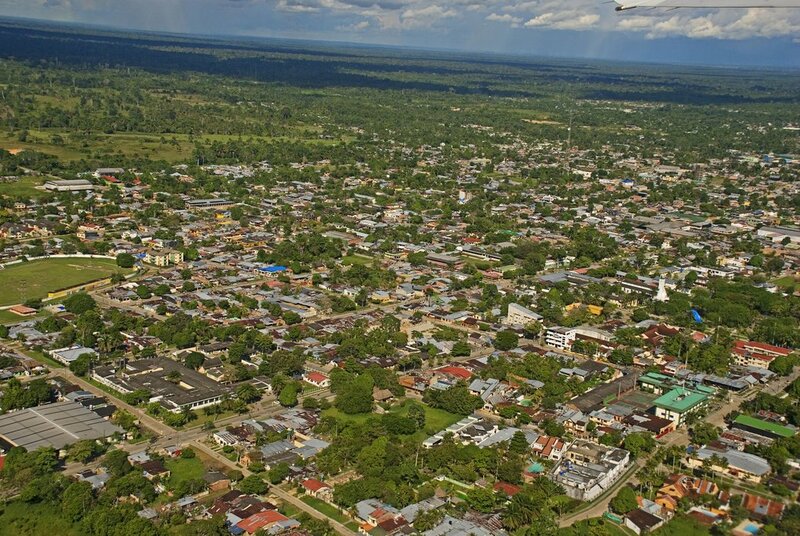 The easy-going town of Leticia, undoubtedly the most laid-back town on the Amazon, makes a great base from which to explore the forest, and also to take excursions up the river, where the eco-village of Puerto Nariño provides a model for sustainable living. Many of the local residents here belong to Indigenous peoples such as the Ticunas, the Yaguas and the Cocanas, and deep in the forest, you can still meet Indigenous people living a hunter-gatherer lifestyle that hasn’t changed for generations. It’s also easy here to take advantage of the three-way border on which Leticia sits, with free access to the adjacent parts of Peru and Brazil. Just a short boat ride across the Amazon, on the island of Santa Rosa (Peru), you can enjoy a delicious ceviche for lunch. Back in Leticia, it’s an easy stroll over to the Brazilian town of Tabatinga, where you can try Brazil’s national cocktail, a caipirinha, for an excellent sundowner. It is now becoming possible to visit other, more remote and previously inaccessible areas of Colombia’s Amazon region by plane (often a cargo plane) from Bogotá or Villavicencio. 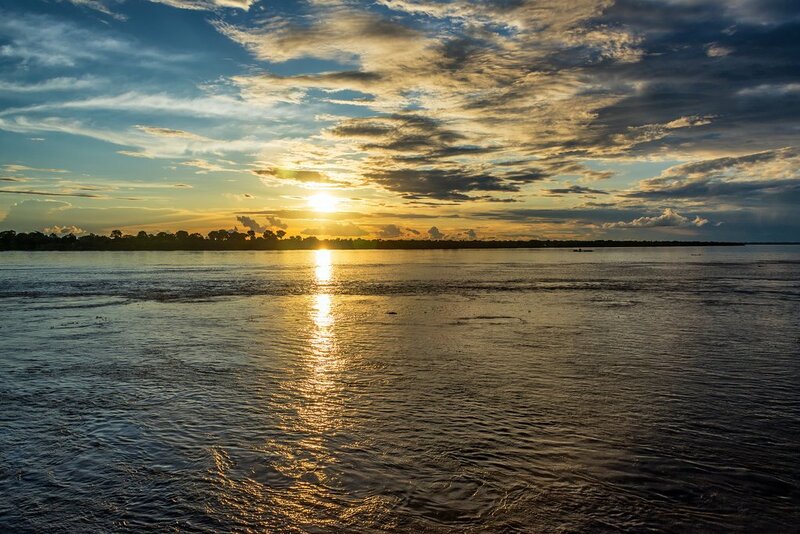 Leticia, however, remains the most important and easiest base for visiting the Amazon region. River traffic at the port in Tabatinga in Brazil. It’s best to plan for at least five days and four nights. Your excursion into the rainforest will take three days and two nights, possibly more, and you’ll definitely want to hang out in Leticia for at least another day or two before you leave. For most travelers, a 7-Day tour to Leticia, Puerto Nariño and places in between, is ideal. If you have three days, you won’t be able to see much of the jungle, but there are one-day walks available, and you can still pop up to "Los Kilometers" for a walk through the canopy, take a day-trip up to Puerto Nariño, and pop over to Peru for a ceviche and Brazil for a caipirinha (Brazil's national cocktail). If you have six days, you should definitely go on a three-day “bit of everything” excursion. You can walk and/or boat through the jungle, fish for piranhas and camp in the forest, before heading back to a comfortable hotel bed in Leticia. Traveling up to Puerto Nariño for a day is another good option. If you have ten days, you’ll be able to take a more in-depth jungle tour, check out both “low forest” (seasonally flooded) and “high forest” (above water all year), or take a shorter tour and spend longer visiting Puerto Nariño and hanging out in a Ticuna village. Mosquitos in the Amazon can spread not only malaria but also other diseases such as yellow fever, dengue and the zika virus. Luckily, good mosquito repellents containing DEET are easily available in Leticia, although you might want to consider bringing a high-concentration DEET repellent from home, or one containing the less toxic PMD instead. Drugs that prevent malaria are available, but consult your doctor before taking them. Make sure you have been vaccinated for yellow fever, and it’s a good idea to carry the vaccination certificate too, in case the immigration authorities ask you for it. In case of stings or bites, you might also consider packing some anti-histamines. Seasonal flooding in Colombia's Amazon can occur from March until the end of May. The average temperature in Leticia remains pretty constant at just under 80°F (just over 25°C) year round, with high humidity and quite a lot of rain, which gradually increases from November to May, at which time the river is rising. 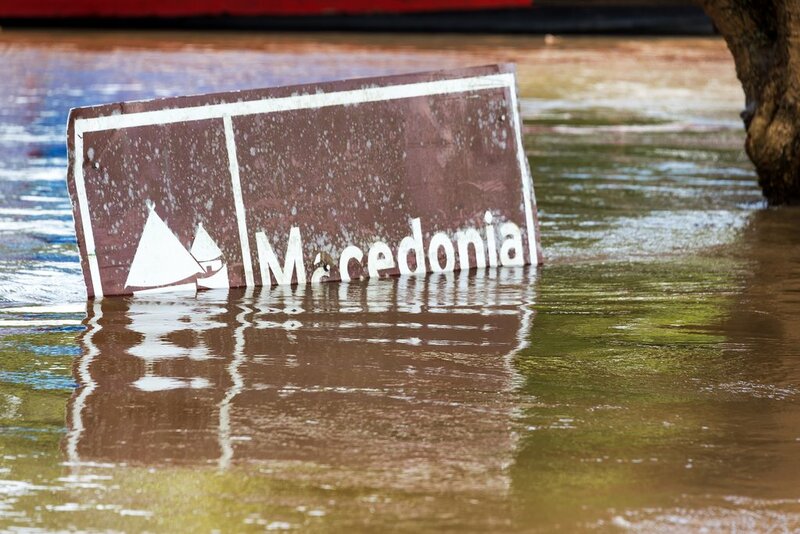 Low forest areas become completely flooded (but still accessible by boat) from March until the end of May, when the rain eases up and the floods recede, the driest period being in July and August. Pack light clothing and consider taking an umbrella. Waterproof ponchos are readily available locally. Long sleeves and trousers will defend you to a certain extent against insect bites. A sunset over Leticia. The city can be visited year round, with the best period from November to February. The Amazon can be visited year-round. You can hike through high forest areas (largely on the Colombian side of the border) at any time. In low forest areas, which are mostly on the Peruvian side, and the most popular with visitors, you can get around by boat when the river is high enough, and on foot when it isn’t. The ideal time to visit is November to February when you can do a bit of both. The two daily flights from Bogotá can get booked up quite quickly, and it’s always a good idea to buy your tickets a few weeks in advance if possible, but this particularly applies over holiday periods such as Christmas, New Year and Semana Santa (the week before Easter). March: Santa Semana or Holy Week (the week before Easter) is celebrated as everywhere in Colombia with visits to church and sometimes enactments of the Easter Bible story. April 25: The anniversary of Leticia’s foundation is celebrated with a parade to the main square, the Parque de Santander. July: Festival de la Confraternidad Amazónica celebrates the friendship between countries on the three sides of the border here – Colombia, Peru and Brazil – is celebrated with sports competitions and a beauty contest. November: Pirarucú de Oro Festival is a celebration of Amazonian popular music held at the end of November, with a big stage in Parque Orellana and live performances by bands from around the region. December 7: Dia de las Velitas, Locals light candles outside their homes in the evening to celebrate the Immaculate Conception, giving the whole town a lovely festive atmosphere. 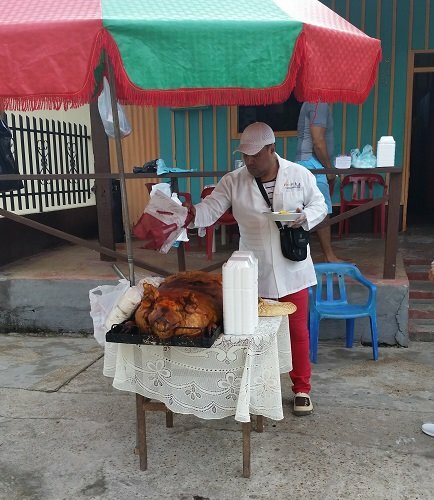 Christmas and New Year are celebrated in Leticia as elsewhere in Colombia, with gift giving on Christmas Eve, and eating parties on Christmas Day. New Year’s Eve still tends to be a family affair rather than a night to go out partying. This is a border area and a lot of smuggling goes on, with associated gangsterism. You’re certainly safe in the center of town, but you don’t want to wander out onto the edges of town, especially at night. Tabatinga, on the Brazilian side, is a good deal rougher than Leticia, and you should take particular care when visiting at night. After dark in Tabatinga, it’s best to take cabs or motorbike taxis rather than wander around on your own. View of the Leticia before touching down at Vasquez airport. Leticia’s little Vasquez Cobo airport, at the northern end of town, gets two flights a day from Colombia’s capital, Bogotá, one with LATAM, the other with Avianca, both of which have international connections into Bogotá from North America. You can stroll into the town center from the airport in about twenty minutes, or you can take a taxi. 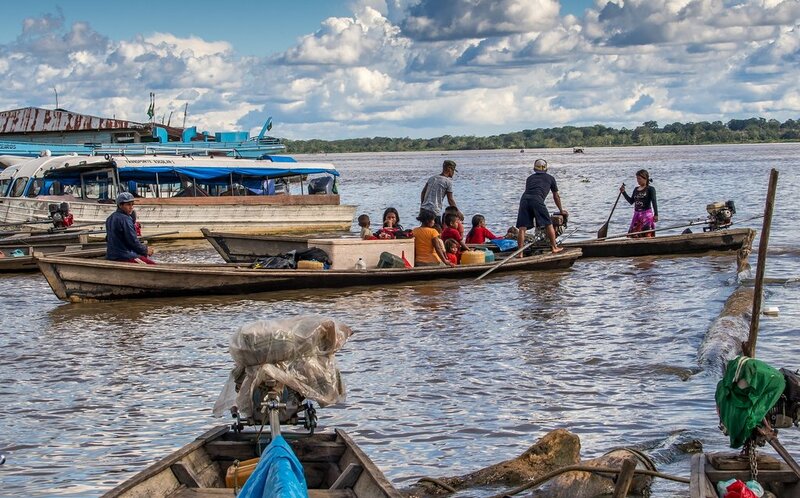 Aside from that, the adjoining Brazilian town of Tabatinga has flights to Manaus, where there are connections to the rest of Brazil, and there are boats downriver from Tabatinga to Manaus, and upriver to Iquitos in Peru. There are no road connections from Leticia to the rest of Colombia, and the only way to get here from Bogotá without flying would involve heading overland to Ecuador and then making your way downriver by boat to Iquitos – it’s certainly possible, but it would take some weeks. 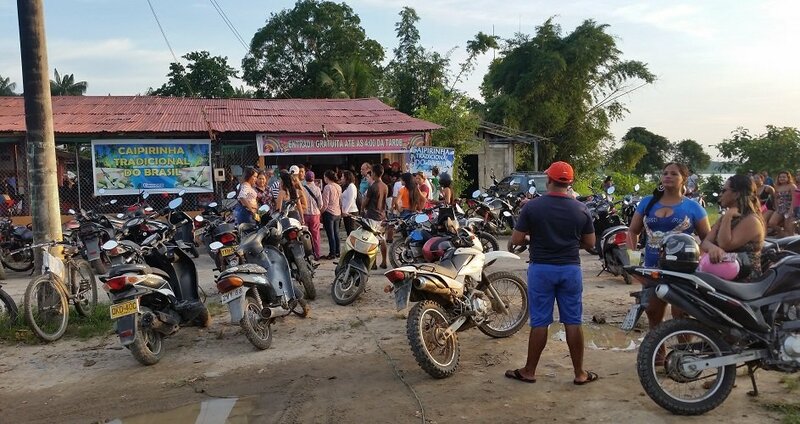 Motorbike taxis are a popular form of transport in Leticia. Leticia is small enough to navigate on foot. 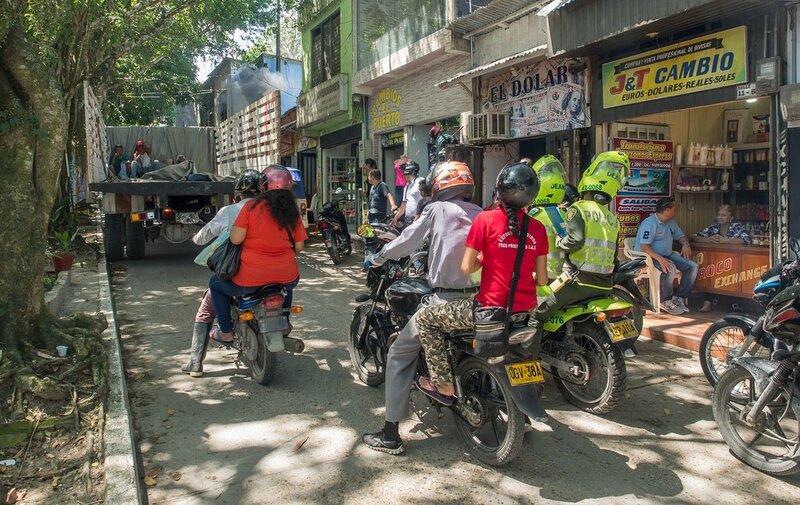 Failing that, the main form of transport is motorbike taxis, which can take you over to Tabatinga or places along the Kilometers” road. Slightly more expensive Tuk Tuks and cabs are also available. In addition, colectivos (minibus) ply the route between Leticia and Tabatinga; some of these go only as far as the center of Tabatinga, while others go all the way out past the airport to Comara. Another colectivo service heads up the “Kilometers” road to Km11. Both of these start their journeys at Plaza Orellana. There’s also plenty of river transport. Small informal ferry boats gathered at the waterside in Leticia and Tabatinga can take you to Santa Rosa on the Peruvian side. In addition, speedboats leave Leticia three times daily for the two-hour journey upriver to Puerto Nariño. Leticia has limited hotel options. While many are rudimentary, there are still some very comfortable places to stay in town. This safari-style hotel is Leticia’s best, and while it isn’t a five-star, it’s a lovely place to stay, with 28 spacious rooms, all equipped with air-conditioning or ceiling fans, cable TV, a mini-bar and a hammock. Room service is available. The room rate includes a complimentary buffet breakfast, and the hotel has a breezy restaurant, a lobby bar and a pool. They also put on music and traditional dances, with something different every night, and there are free tours of the town. 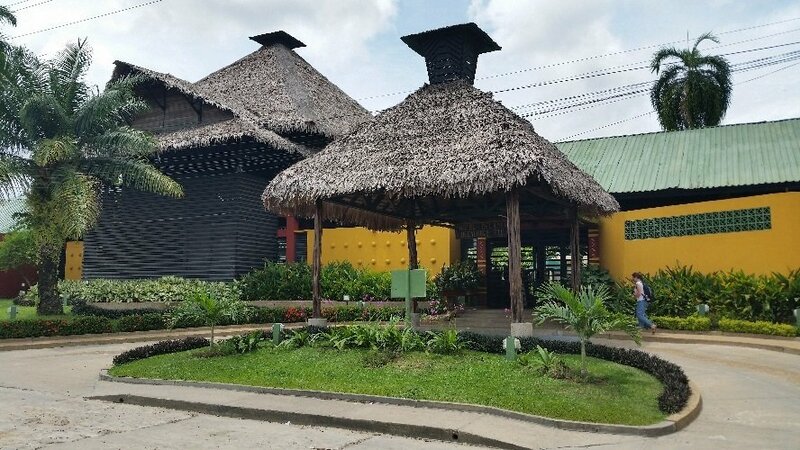 The Decameron is located just out of the center, far enough to be free from the incessant traffic, yet just a block away from the Parque Orellana. It is only 300 m from the port and the town’s main square, the Parque de Santander, so it’s location is ideal for both peace and quiet, and easy access to the town. This is Leticia’s first and best boutique hotel, with just ten rooms, and you can be sure you’ll be well looked after here. The rooms are bungalow-style with thatched awnings, set around a lovely little lawn. They’re spacious and airy, with big, comfy beds and cool, simple décor, and they’re equipped with refrigerators and modern bathrooms. Every room has a verandah with a hammock, and there’s 24-hour room service. Room rates include an excellent breakfast, with Colombian, Brazilian and Continental options, there’s an outdoor jacuzzi, and plenty of space to relax. The staff readily give out great advice and suggestions, and they also like to give guests fruit juice treats from time to time. You couldn’t hope for a better location either, in a quiet, residential street, but less than two blocks off the main square, and within walking distance of the town’s attractions. Centrally located Waira Suites has fast become one of Leticia’s most popular places to stay. It’s super-clean and very modern, with air-conditioned rooms and good sound insulation, so it’s pretty quiet, even though it’s in the middle of town. After a trip to the jungle, those crisp white sheets and king-size beds are just heaven, and as an extra little touch, the room decor is seasonal, with splashes of color which they change according to the time of year. The hotel has two swimming pools, not to mention an excellent bar. Buffet breakfasts here are great, and it’s well worth checking out the restaurant at dinner time too. Our tip for the best room is to take one upstairs at the front. This quiet retreat, a little way out of town towards the airport, has a peaceful and relaxing location in a quiet neighborhood. The owner, an academic at the local university, is a mine of information about the region and its people. The place is custom-built from scratch, using recycled materials wherever possible – you can even see the drink bottles built into the walls to allow light through at strategic places. 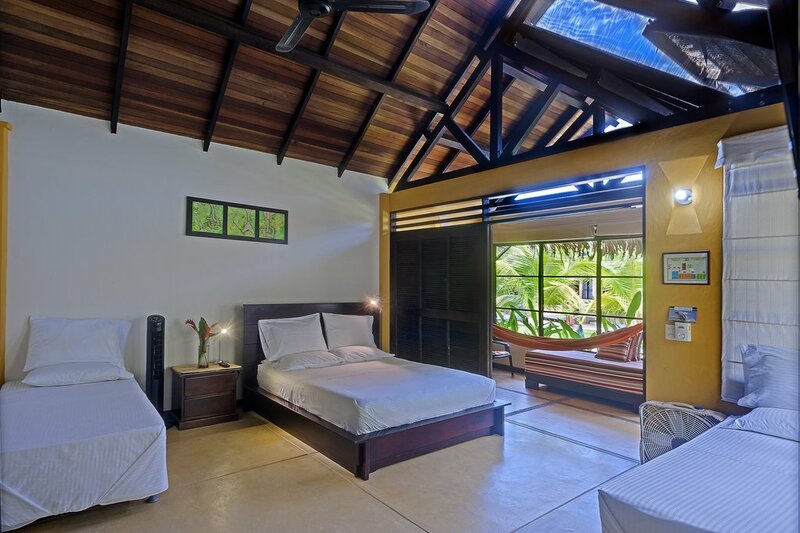 Every room has a hammock and a bed – you can sleep or relax on either. While the Apaporis isn’t quite a hostel as the name suggests, it does have hostel-style prices, making it one of the best bargains in town. It's also very handy if you want to get a flight up to Bogotá, or to one of the more local destinations served from Leticia’s airport. Breakfast is included. Just across the border in Brazil, the Takana is the best place to stay in Tabatinga. Elegant, in a modest kind of way, and decorated with jolly painted wood carvings, it has a range of rooms, including suites with very spacious rooms and big balconies. The breakfast here is excellent – a proper Brazilian affair, with regional specialties too. The rooms are arranged around a lush little garden with a fountain. The hotel has a bar and a restaurant, and the location is quiet but just two blocks from Tabatinga’s main drag, where you can pop down at lunchtime for a meal. The local favorite is a por quilo meal (you choose what you want from a mixed buffet, weigh it, and pay for it by weight). In the evening, a number of bars serve caipirinha (Brazil's national cocktail). Because of its location, this hotel is especially handy if you’re taking a boat down the river to Manaus. The local specialty is fish, fresh from the Amazon, with a number of local species that you won’t find elsewhere. A particular favorite is pirarucú, a meaty and very tasty fish, which breeds from mid-November until mid-March, at which time you should avoid eating it unless you are sure it has been sourced sustainably. If you really want to be adventurous, try some mojojoy (local jungle grubs) often served stuffed with meat. On Sundays, many food shops (and even private homes) sell suckling pig with rice on the street. 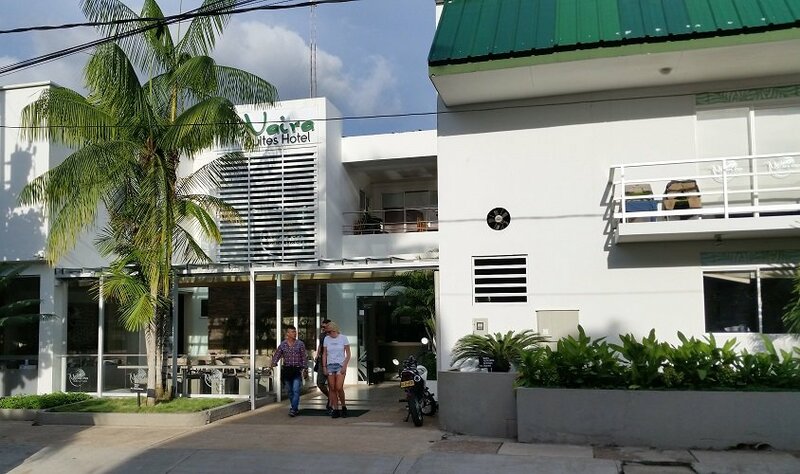 Leticia’s top restaurant is Tierras Amazónicas (address: Calle 8 #7–50), where the signature dish is fillet of river fish steamed in a banana leaf. To wash it down they have an extensive selection of delicious juices made from Amazonian fruits with names like copoazú or kamu-kamu. Local fusion cuisine is served just around the corner at El Cielo (address: Carrera 6 #6–11), which specializes in pizza-like casabes, with a choice of locally inspired toppings on a cassava-bread base. This is the place to try mojojoy as a starter if you fancy it. 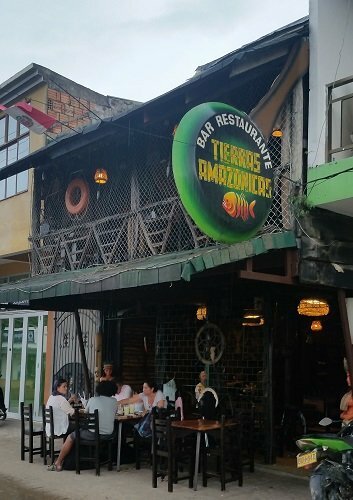 Another treat is to take the boat across to Isla Santa Rosa, in Peru, where the Brisas del Amazonas restaurant serves up an excellent Amazonian ceviche (raw fish marinated in lime juice), accompanied by ice-cold Peruvian beer. Local macaws often drop by to say hello while you’re eating. In the late afternoon, head for the Comara Show Club, at the very far end of Tabatinga, where you can sip a cairpirinha – Brazil’s national cocktail, consisting of cane spirit and lime juice – while watching the sun go down over the river. On Sundays, they put on a wild show with singers and exotic dancers (of both sexes), and large numbers of people gather for the party. Comara Show Club is a nice place to enjoy a cocktail and listen to live music.